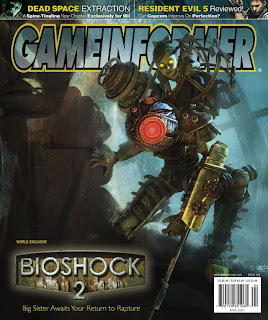 Okay we've been talking about it the past few days, Bioshock 2 is all up on the proverbial radar. Each day reveals a new sweep over at Somethinginthesea.com, but today we've learned of some pretty damn cool news (confirmation). The new Big Daddy, is actually a Big Sister? Believed to be tall, thin and much faster than her counterpart, here is the first image from the upcoming cover of Game Informer's April issue. Expect alot more information to start pouring in, this is huge, and we're excited. Keep checking out the viral site, and stay tuned to Mashbuttons.com for all the latest news as it develops on this one.